My girls love sweet treats for breakfast but I try to limit them to not too many sweets in the morning. 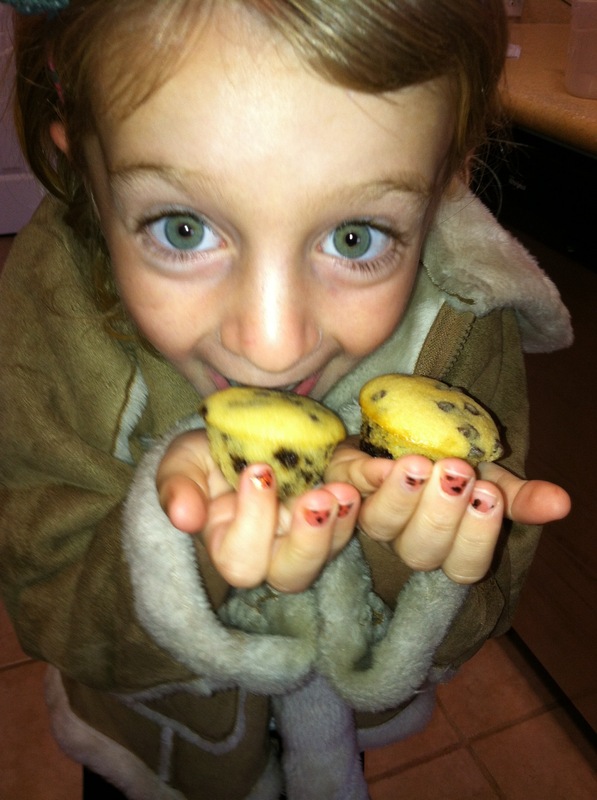 For a while my oldest always wanted me to buy her those packs of mini chocolate chip muffins in a box they have at the grocery store. It was probably because it was by the register so we sat there by it with our cart and she was tempted to eat them after staring at them for ten minutes. We did buy them a few times when she was smaller because they were convenient and quick for an on the go breakfast. They seemed to taste good and they looked like muffins. But then one day I read the ingredients and there were very few that I could actually pronounce. It was funny because the package said “all natural” but there was not an egg or teaspoon of anything I could read in English listed. So I went on a mission to find a homemade alternative. I found the recipe posted below and tried it out. I got rave reviews from my little tasters and I felt good about giving them a treat for breakfast that only had 10 ingredients in it that were in my pantry. Muffins should have natural ingredients like sugar, flour and butter in them, to me homemade is better than anything “healthy” at the store, so whip these up for a real treat. In a large mixing bowl, cream sugar and butter until fluffy. Add egg, milk, and vanilla; mix well. Combine dry ingredients. Gradually add to creamed mixture; mix well. Fold in chocolate chips. Spoon about 1 tablespoon of batter into greased or paper-lined mini-muffin cup. Bake at 375 degrees for 10-13 minutes or until muffins test done. Cool in pan 10 minutes before removing to a wire rack. You are currently browsing the What Tara's Cookin' blog archives for November, 2013.